Mucocutaneous diseases in the pediatric population are extremely rare and, hence, can have both psychological and behavioral bearing. Mucosal conditions in children include herpetic stomatitis, vesiculobullous lesions, aphthous and traumatic ulcerations, candidiasis, lichen planus, and drug-related mucosal lesions. This case report deals with a rare presentation of a 4-year-old child reporting with an extensive involvement of oral cavity with erythematous, ulcerative, and pigmented areas associated with drug intake. Oral lichenoid drug reactions are rare in children and resemble idiopathic oral lichen planus histologically and clinically. These reactions are associated with the intake of various drugs and dental materials (allergic reactions; contact hypersensitivity). However, exact etiopathogenesis of lichenoid reactions is still unknown; these get resolved if the triggering factor is identified and removed. This case report deals with a rare presentation of a 4-year-old child reporting with an extensive involvement of oral cavity with erythematous, ulcerative, and pigmented areas associated with drug intake. A 4-year-old child reported to the Department of Pediatric and Preventive Dentistry. The child was apprehensive and in visible discomfort. History obtained from accompanying parent was that of extensive ulcerative involvement of oral cavity due to which the child was unable to feed properly. A medical history of pulmonary infection for which the patient was undergoing treatment was elicited. The duration of onset of condition was for the last 2 years, i.e., as soon as the drug therapy was initiated. On physical examination, the patient was weakly built. Hematological investigation revealed a reduced bleeding time of 1 min 30 s. All other parameters (hemoglobin, total leukocyte count, differential leukocyte count, and clotting and bleeding times) were normal. Extraorally, pigmented areas on vermillion zones of both upper and lower lips were seen. Intraoral examination showed extensively pigmented blackish–gray areas on dorsum of tongue and buccal mucosae on either side. Anterior maxillary and mandibular labial gingivae were highly erythematous and bled on probing. A large erythematous area (2 cm × 2 cm) was present on the left posterior buccal mucosa adjacent to the retromolar area; the adjacent normal mucosa was selected as the biopsy site [Figure 1] and [Figure 2]. On microscopic examination, a nonkeratinized hyperplastic stratified squamous epithelium with features of basal cell degeneration, exostosis, civatte bodies, and basement membrane duplication was seen. Underlying connective tissue was fibrous and was infiltrated with chronic inflammatory cells deep into the submucosa. Numerous small lumen blood vessels containing extravasated red blood cells were also evident. Based on these features, a histopathological diagnosis of “lichenoid reaction” was given [Figure 3]. 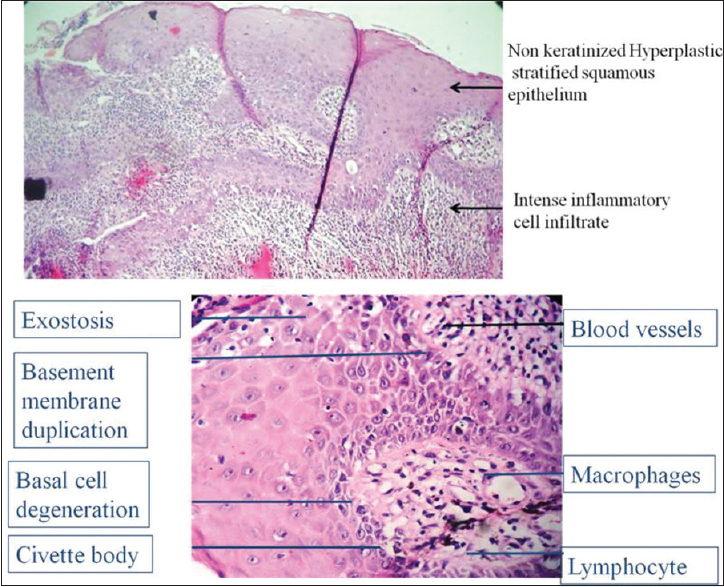 Based on the clinical findings of extensive erythematous as well as large pigmented areas coupled with histological picture of lichenoid epithelial-connective tissue interface, a histopathological diagnosis of lichenoid reaction was given. The patient was put on corticosteroid triamcinolone by both oral and topical routes for the oral lesions with regular follow-up visits at the intervals of 7–10 days. The patient showed about 40% relief after 3 weeks of treatment. Relapse was seen and hence the patient was put on dapsone therapy (16 mg/day; according to per kg body weight). The patient is on regular follow-up [Figure 4]. Drug-induced oral reactions or lesions were first cited by Almeyda and Levantine (1971). This condition can be found affecting any age group. However, it is a rare presentation in pediatric patients. A plethora of oral reaction patterns have been cited in literature. These oral reactions can present in a variety of clinical presentations which are nonspecific and mimic conditions such as pemphigus, pemphigoid, erythema multiforme, and lichen planus. Common drug reaction patterns seen in oral cavity [Table 1] are stomatitis, ulcerations, swelling (angioedema), salivary gland enlargement, xerostomia, white patches, hyperpigmented areas, candidiasis, hemorrhage, and allergic reactions.,, The pathogenesis of oral lichenoid reactions is not clear and is most likely a sequel of hypersensitivity reaction. Clinical presentation of this case resembled that of vesiculobullous eruptions, erosive lichen planus, major aphthous ulceration, and erythema multiforme. However, due to drug-related medical history and a “lichenoid reaction” microscopically, this case can be diagnosed as “lichenoid drug reaction.” The treatment and management of this condition require identification of triggering factors and its subsequent exclusion. Numerous medications have been reportedly involved in causation of this reaction pattern [Table 2]. In drug-induced lichenoid reactions, evaluation of risk–benefit ratio involved in suspending the medication is required. Even in the absence of the offending drug, the lesions would take months to heal completely. This case deals with an unusual clinical presentation of a 4-year-old boy severely affected with lichenoid reaction. As a pediatric dentist, one should be aware of such lesions and their management. Almeyda J, Levantine A. 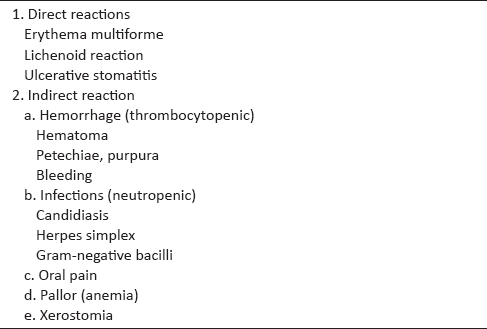 Drug reactions. XVI. Lichenoid drug eruptions. Br J Dermatol 1971;85:604-7. Tack DA, Rogers RS. Oral drug reactions. Dermatol Ther 2002;15:236-50. Sonano J, Sarrion G. Drug-induced oral lichenoid reaction. A literature review. J Clin Exp Dent 2010;2:e71-5. Scully C, Began JV. Adverse drug reactions in the orofacial region. Crit Rev Oral Biol Med 2004;15:221-39. McCartan BE, McCreary CE. Oral lichenoid drug eruptions. Oral Dis 1997;3:58-63. Halevy S, Shai A. Lichenoid drug eruptions. J Am Acad Dermatol 1993;29:249-55. Edwards PC, Kelsch R. Oral lichen planus: Clinical presentation and management. J Can Dent Assoc 2002;68:494-9.